It's Facebook Fridays! for July 15, 2016! 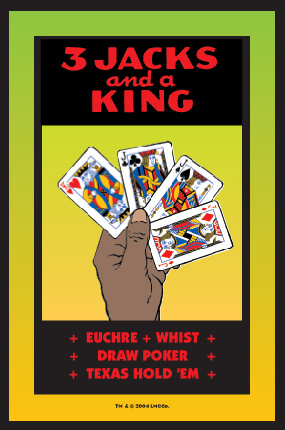 If you like to play, we have just the thing, you'll win your way with Three Jacks and a King! The Lucky Mojo Curio Company is holding a random drawing to give away 9 great Three Jacks and a King spiritual supply prizes that bring luck in games of chance. 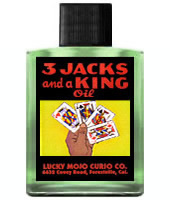 Each of our lucky winners will receive a bottle of our famous hand-made Lucky Mojo brand Three Jacks and a King Dressing Oil. First thing tomorrow morning, we will select NINE winners at random, announce their names here, and ask them to message this Facebook Page with their mailing addresses, so we can send them their FREE Three Jacks and a King products. We have a winner! In fact, we have 9 lucky winners! Our Facebook Fridays! winners for July 15, 2016 are: Lisa Franzetta, Jasz Canavan, Maria Van Moppes, Yolaine Baca Robinson, Amberrose Hammond, Rosalyn Marie M, Milz Commodore, Donna Patterson, and Grey Wan.